Roger Williams founded the state of Rhode Island and the Baptist movement in America. Here is his monumental story of establishing a governmental body to provide genuine "freedom of religion and soul liberty." Participating scholars include Edwin S. Gaustad, Professor Emeritus at the University of California Riverside; Derek H. Davis, Director of Church State Studies at Baylor University; Keith Francis, Chair of the History Dept. at Pacific Union College; and J. Stanley Lemons, Professor of History at Rhode Island College. Fullscreen. Who is Roger Williams? I knew the name and knew something of the man largely because of my reading of and about the Puritans. But I had little idea of his importance to America. This short video, produced by Freedom Research Productions, attempts to set the record straight on a man who was courageous, compassionate and filled with love for God. Roger Williams was founder of the state of Rhode Island and the Baptism movement in America. While many early settlers of the New World regarded the Natives with disdain, Williams treated them with respect and sought to evangelize them not with the sword, but with the gospel. He created the first English-language native dictionaries, mastering several of their languages. But perhaps his greatest contribution to America was his recognition of the necessity of separation of church and state. Williams believed that the church and the civil authorities must remain seperate. He denounced the Church of England as an apostate body and preached against taking oaths such as those required by courts of law. Williams’ strong beliefs led to his banishment from Massachusetts. For fourteen weeks, in the dead of winter, he wandered the land and lodged with his Indian friends. In June he arrived at the future location of Providence and purchased the land from the Natives. He then founded Rhode Island upon the foundations of tolerance and the seperation of church and state. This video tells Williams’ story. At only 45 minutes it can, naturally, only scrape the very surface of his life, but it does quite a good job of touching on the major incidents that defined him. Furthermore, it goes on to discuss his importance in American history, showing that many other states, and ultimately the nation, came to be founded on the principles he held dear. This documentary resurrects the memory of the man who originated the phrase "separation of church and state." 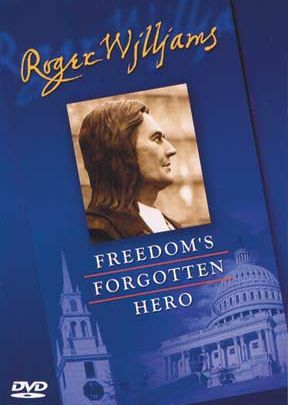 It was not Thomas Jefferson, but puritan Roger Williams who, faced with the oppressive theocracy of the Massachusetts Bay Colony in the 1600s, came up with concept of a wall or "hedge" between the secular powers and the church. The film gives the impressive background story to Williams' struggle for religious liberty, beginning with Constantine's embracing Christianity and coming up through the horrible crimes of the Inquisition and the persecution of dissenters by Protestants as well as Catholics during the Reformation. Using actors to play Williams and his arch opponent Cotton Mather, a sort of debate is staged, each leader giving his reasons for his position. Mather was the most popular preacher of his day and seemed, with the banishment of Williams, to have won the debate, but it is the exile's teachings that became a part of the laws of the colonies of Rhode Island, Pennsylvania, the Carolinas, and finally of Virginia and the new United States. The film ends with the dedication, ironically in Massachusetts, of a statue of Roger Williams, during which Joan Brown Campbell pays stirring tribute to the man. This is a fine video not only to give due honor and recognition to "Freedom's Forgotten Hero," but it could be shown also to remind us of the cost of our precious heritage during a celebration of July 4th or Constitution Day.